There’s nothing that says summer quite like a nice juicy tomato. One way that you can use tomatoes during the summer is to juice them so you can enjoy the refreshing and healthy juice that they have to offer. Of course, you probably won’t want to undertake this by hand, so purchasing a tomato juicer is definitely a great idea. Why Buy a Tomato Juicer? You may be wondering why you should purchase a juicer machine for juicing tomatoes in the first place. Why not simply use a blender or food processor? Well, you’ll find several reasons that a juicer makes a great purchase. 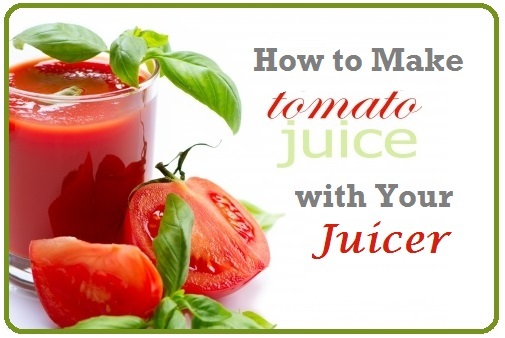 One big reason to purchase your own juicer for tomatoes is that they’ll help remove the pulp from the tomato juice. The skin and seeds are eliminated so you get a smooth juice that tastes wonderful. Juicers also make it easier for you to get that tasty tomato juice, since they take care of all the work of juicing. 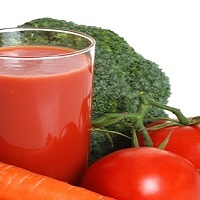 Quality juicer machines also help you enjoy more nutrients than you would if you drank tomato juice from a can. Now that you realize why having a real tomato juicer is so important, you may be wondering what to look for when you make this kind of a purchase. Here are a few tips to keep in mind as you compare the options available on the market. 1. Manual Press vs. Electric Juicer – First, you need to decide what type of juicer you are going to go with – a manual press or an electric juicer. 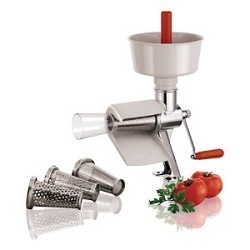 Tomato presses are a popular option because they are reasonably priced and they are still fairly easy to use as well. Simply turn the handle or the crank and you’ll begin juicing those tomatoes. The most popular model is the Paderno World Cuisine Tomato Juicer. Click here to see details and reviews. Of course, electric options cut down on the work that you’ll have to do but they are more expensive. A quality electric juicer may be a good choice if you plan on juicing other vegetables and fruits as well. 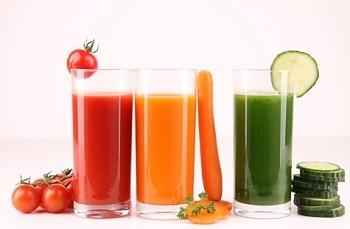 Click here to see our top-rated juicing machines. 2. Check the Capacity – The capacity of the tomato juicer is important as well and you should check the capacity whether you are going with a manual press or an electric juicer. If you’re only juicing tomatoes for yourself, a smaller capacity option will be fine. However, if you’re juicing for several people, you’ll want a juicer with a large capacity so you can juice many tomatoes at once. 3. Read Reviews – Before purchasing your own juicer, take some time to read reviews on tomato juicers. This allows you to learn more about these juicers, how they work, and how satisfied other consumers are with them. You’ll get beyond product hype and really learn about the pros, cons, price, and more when you read reviews. If you want to begin enjoying sweet and refreshing tomato juice at home, why not go ahead and purchase your own tomato juicer. Keep these tips in mind and ensure you purchase the best one for your needs. Is wheatgrass good for you? 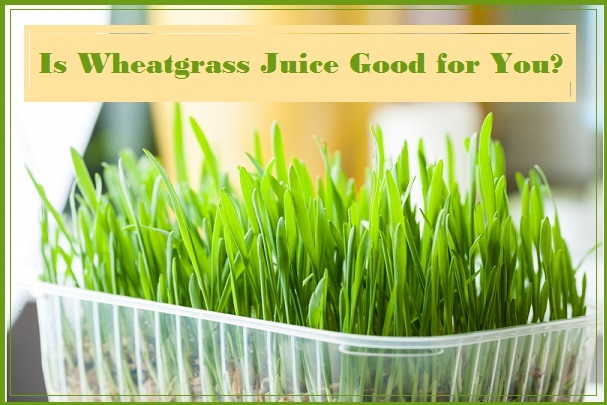 Wheatgrass juice has very powerful health benefits. It is considered one of the best food medicines around and you can make it at home in your juicer. Wheatgrass contains so many beneficial nutrients it’s a wonder why doctors don’t prescribe a shot of this superfood for more patients. Wheatgrass juice contains chlorophyll, vitamins A, B, C, E, and K. It is high in protein. It contains seventeen amino acids. Chlorophyll alone is beneficial and helps the body to fight off free radicals (cancer causing agents.) Chlorophyll helps to fight off harmful bacteria. It helps to neutralize toxins and acts as a cleanser for the liver and the blood. It helps to regulate blood sugars. Wheatgrass juice provides quick energy. Drink it for a boost of energy at the start of the day. It’s perfect to drink before doing a workout. Drinking wheatgrass juice on a regular basis will help to heal the skin of acne. It can even help to heal scars if consumed over seven to eight months. It may help to prevent tooth decay and promotes good oral health. Wheatgrass juice can be used as a gargle to soothe and treat sore throats. Consumption of this juice will help to treat chronic skin issues such as psoriasis or eczema. Wheatgrass juice helps with digestion. It helps to treat arthritis when applied via a cotton pad directly on the sore joints. Daily consumption of wheatgrass juice helps to strengthen the immune system. Because it gives the body energy, it helps to stay active. Exercise and a wholesome diet which includes wheatgrass juice are very beneficial to maintaining a healthy lifestyle. Before you begin, examine the wheatgrass and make sure it is free of mold. Then rinse it in water to rid any soil or other debris. Rough chop the blades of grass on a chopping board. You need at last ½ cup of cut blades to make the juice. It is best to use a wheatgrass juicer, a particular juicer just for wheatgrass. If you use a regular juicer, you must be aware of the potential for the wheatgrass to clog the juicer and it may need to be cleaned out before the juice is complete. Wheatgrass juice is most potent straight. It’s best drunk in shots so a ½ cup of chopped grass blades will make 2 servings. It’s okay to store wheatgrass juice for up to a day in the refrigerator. If the juice sits in the fridge for longer, it becomes less potent. *After making the wheatgrass juice mix with 6 ounces of lemonade. *Mix with 6 ounces of carrot juice for a vegetable drink. *Juice with 3 stalks of celery, 1 chunked cucumbers, a handful of spinach leaves, ½ cup of parsley. Add a little filtered water to help it during the juicing process. 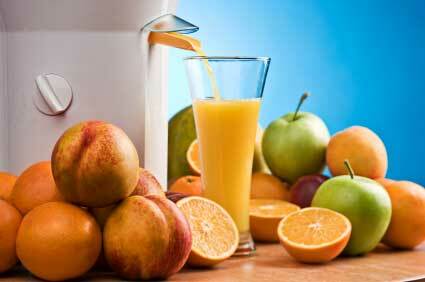 Make a healthy fruit juice by first juicing 2 apples and an orange. Mix in with the wheatgrass juice and add honey to taste and a pinch of cinnamon. Is Wheatgrass Juice Good for You? YES! Go try some today! Learning how to make tomato juice with your juicer can be as complicated or simple as you want to make it. You might want to learn how to make a single glass of homemade tomato juice when you have the craving, or you may be interested in learning to can homemade tomato juice while tomatoes are in season and offered at affordable prices. Whatever your intentions are, this guide will tell you how to make delicious tomato juice in your own kitchen with the juicer you already have on hand. The first step is always to get your tomatoes together and decide whether you are juicing up a small batch of tomato juice or creating a large batch to be canned for later use. This will determine exactly how you take each step in the process. The more juice you want to make, the more fresh tomatoes you need on hand. Remember that fresh homemade tomato juice won’t keep in the fridge for long, so don’t make more than you can drink right away if you are not canning. If you want to can your homemade juice, gather all of your canning supplies as well as the tomatoes. You want to have everything needed on hand so you can get the job done as quickly as possible. Once you know what you are doing, it is time to get the process going. Start by removing the skins from your tomatoes. The easiest way to do this is to immerse them in boiling water for a minute and then immediately immerse them in ice cold water. The skins come off very easy after that processing. This is often the procedure for canning tomatoes, but you can do it even if you are just making a small batch of juice to be enjoyed fresh. Some recommend you remove the seeds from the inside of the tomato as well, but this is not very easy to do and isn’t really necessary. Tomato seeds are very small and the way they are spread inside the tomato makes them tedious to remove. Set up your juicer and start processing your tomatoes. You can make this simple and just juice up the tomatoes, or you can play with flavor by adding other vegetables to the mix. Many people like juicing celery along with the tomato, but you can add any vegetable that you think will add to the flavor. Don’t be afraid to experiment with unique flavors, but do it in a small batch and taste test before doing a large batch. Or, just keep it simple and stick with tomato. How long it takes to juice the tomatoes depends on the speed and efficiency of your juicer and how many tomatoes you are juicing. You may need to cut your tomatoes up into pieces, but that depends on the size of the feeding chute on your juicer and how easily it gets clogged with larger pieces. Once all of your tomatoes have been processed through the juicer, you may choose to chill the juice for fast consumption or you may start the process of canning your juice. You may even choose to put some fresh in the fridge for immediate use while canning up the majority of your homemade juice. Just keep in mind the short lifespan of fresh juice in the fridge. There are advantages and disadvantages to using a steam juicer to make juice in your home instead of using a juice extractor. While juicer steamer is great for some projects, it may not be the healthiest option for juicing. Steamer juicers were created to heat the juice and destroy the enzymes so that you can save juice like you preserve vegetables when you can them and put them on the shelf. Steam juicing is a fairly simple process. They work by steaming the produce to cause the cell walls to break down and the juice is released into a container that is then drained into bottles or jars. The juice is concentrated because you use the heat to extract the juice from the fruits or vegetables. While we would not recommend this as a preferred method to make juice, there are some reasons that you may want to try it. If you do not have regular access to fresh produce, but want to make large qualities of juice to store for later, this may be an option for you. Steamed juice is “sterile” so it can be stored on a shelf for a long period of time without needing to refrigerate or freeze fruit or vegetables to use in a juice extractor for fresh juice. Many people enjoy this method to make homemade jellies and jams. Juice can be made cheaper than store bought juices. While this may be an inexpensive way to create bottles of juice, there are some disadvantages to using a steam juicer instead of a juice extractor. The biggest disadvantage to steam juicers is the heat processing. By using heat to process the fruits and vegetables, you kill many of the health benefits that you gain by having fruit juice in your home. These steamer juicers can only juice certain fruits, such as: rhubarb, peaches, pears, tomatoes, berries, grapes, cherries, apricots, strawberries, raspberries, or apples that are soft enough for the cell walls to be broken down easily in the process. Generally is used like canning to extend shelf life and cannot be used for a fresh glass of juice since the juice created is heated and then must be cooled and stored for use. While there are some good uses for steamer juicers, if you want them to make juice to drink, you may want to consider a juice extractor instead. The juice will be usually taste better and be much better for you. Click here to see the top steamer juicer models.